During his long and successful career, Christopher Makos has photographed the most beloved and intriguing icons of our time-Mick Jagger, Elizabeth Taylor, John Lennon, and Andy Warhol, to name just a few. 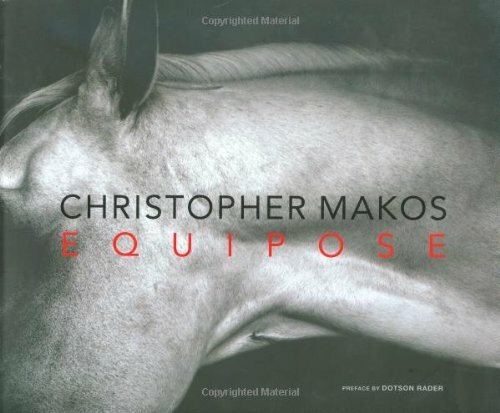 Now in a unique and original work, Equipose, Makos takes on another compelling subject: horses. Photographed in his own distinctive and daringly evocative style, this landmark book transforms what we know about these majestic animals through the lens of a genius photographer. Ranging from brilliantly crisp black-and-whites to luxurious colors and softly muted sepia tones, Makos conveys sophistication and naivete in seamless combination in his photographs of one of nature's most mythic, evocative, and enthralling creatures. The incredible images seen in Equipose do more than just accentuate the musculature and athletic qualities of equine bodies, they elevate and personalize our timeless fascination with a subject that has been photographed endlessly, but has never before been depicted with such a unique eye and insight. Makos seductively lures the viewer into a celebration of all that is desired in and aroused by the animal form in a manner so sensitive that it is sure to appeal to photography aficionados along with anyone who has ever had a penchant for nature's most appealing mount. Equipose gives us an entree into an entire new realm of portrait photography while at the same time offering access to some of the most perfect specimens that are 'working' today. In this exceptional body of work, Makos explores the convergence of art, style, form, function, and even musculature and power. The result is a book every bit as innovative, intriguing, and daring as the man who created it.